The Royal Yacht has travelled more than a million miles to every corner of the world. Britannia is the last in a long line of yachts that date back more than 300 years and there have been 66 in all. Britannia is a symbol of a bygone era conjuring up images of the days of the British empire and so it was fitting she should be at the centre of the ceremony to hand Hong Kong back to China. During the handover ceremonies on 30th June 1997 Britannia formed an impressive backdrop as dragon dancers and drummers held centre - stage alongside. 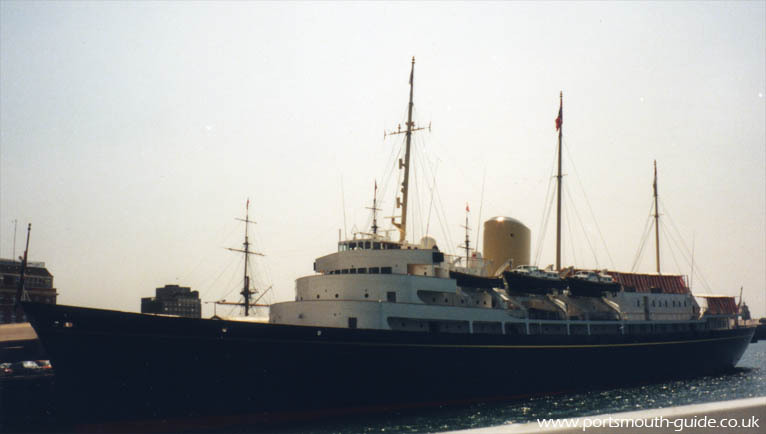 The Royal Yacht's tour to the Mediterranean, Gulf, Indian Ocean and Far East began when she left Portsmouth in January 1997. During the next seven months she was used by the Prince of Wales for his visit to Kuwait, Bahrain and Qatar as well as Hong Kong. Britannia made the journey back from Hong Kong in her fastest time for such a long journey. She then took the Queen on her annual cruise to the Western Isles of Scotland. Some people have estimated that Britannia has secured more than £2bn of trade over the past 10 years through her hosting of 'sea days'. The events provide a forum for British firms to strike deals with overseas companies in the surroundings of the royal yacht. Such was the prestige of the ship that the world's top businessmen and women were attracted to these prestigious events, providing British companies with an unparalleled business opportunity.